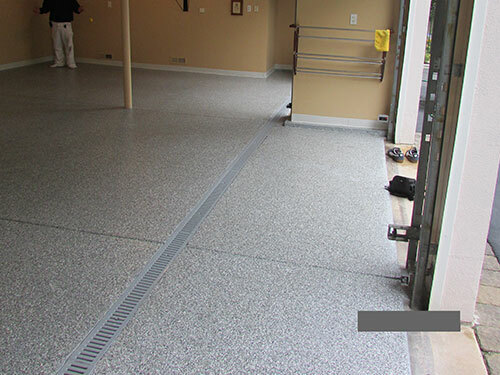 A polymer-epoxy floor in the garage or basement is a great addition to your fine home that is not only a major aesthetic improvement over the typical unfinished concrete in most garages or basements, but provides a long-lasting, easy to clean and maintain, protection for your floor. 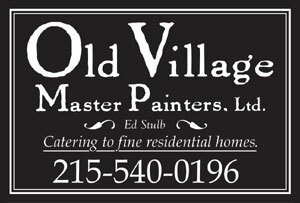 Old Village Master Painters bring the same high level of craftsmanship to your garage, basement, workshop, or showroom as we do to your living room.and offers a range of options from single-coat epoxy to fully flecked multi-layer epoxy floors for both residential and commercial applications. The multi-layer floor shown above is for a car wash application. 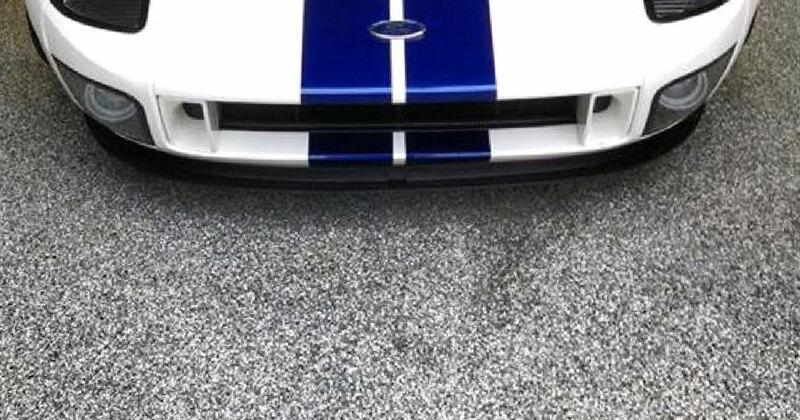 So if you’re a collector of classic cars, have a busy shop or just need to park your daughter's Honda, a new epoxy floor by Old Village is just the thing to add to the beauty and value of your fine home. For a multi-layer epoxy floor, we first grind down the top layer of concrete and add a primer that seeps into and adheres to the concrete. This is followed by a base coat of commercial grade epoxy. The base coat is followed with several coats of clear epoxy and can be fully flecked to add color to the floor. The dry dust from an unfinished concrete floor that makes such a mess on your cars and tools and gets tracked into your home is gone forever. We can even apply this type of floor over concrete with existing oil stains. Old Village Master Painters is experienced in applying these floors in both private and commercial applications. 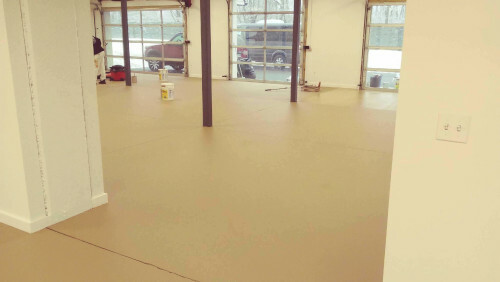 A multi-layer epoxy floor by Old Village Master Painters provides a beautiful, durable, easy to maintain floor for your garage, workshop, basement, or showroom that is resistant to spills, road salt, hot tires, dropped tools - pretty much whatever you can throw at it. 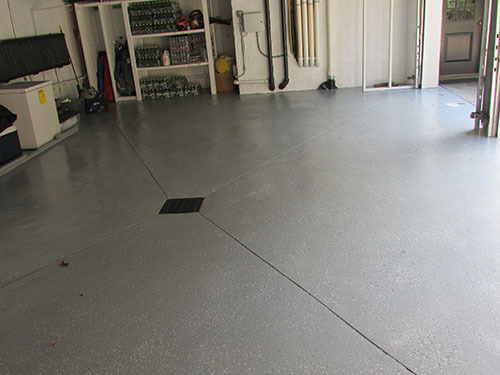 A single-layer epoxy floor is another great solution to protect and improve the look of your garage or basement. This type of floor is also durable, easy to maintain, and resistant to spills, road salt and eliminates the concrete dust you get from an unfinished floor.